Last week, I was honored to sit down and chat with Jacob Smith who was one of the three film makers who worked on Waking the Sleeping Giant. A film that is about, among other things, the 2016 Presidential election. However, if you watch the film (or if you read this interview) you’ll find quickly that this film is really about so much more. What follows is a transcript of that interview; it’s been edited for readability and clarity. What is your background, are you trained in film? Did you go to school for it? Or is it something you like to do? I did not go to film school, none of us did, my background is more in politics and advocacy. I was both in local politics – I live in Golden, Colorado. I was on the City Council and was later the Mayor. I’ve been in activism for a long time, I’ve been an activist for pretty much my entire adult life. I then served on Senator Bernie Sanders’ staff before he launched his presidential campaign. So my background is mostly on the political and advocacy side. I’ve always loved film and when it looked like Bernie might run and it looked like there might be something really remarkable going on across the country. It just felt like the right time to make this particular film. So I pulled Kathryn and Jon together. Kathryn is another political person, Jon is a Professor at the University at Vermont, but he’s also a filmmaker. We turned out to be a really good team with a complementary skill sets and experiences. I actually didn’t expect that. I didn’t expect for you guys to come from an advocacy background- when you watch the film, it’s really well shot. It’s got good directing and good pacing. For me there’s this powerful moment where you first visit this dying food bank at the beginning of the film and then later you revisit that same food bank when Sanders comes to speak there. It’s really this well connected and well rounded moment. It’s good filmmaking. People don’t often mention the second part of what you just said, I don’t know if it doesn’t pop as much or if they don’t quite realize we went back to the food bank, that first food bank scene — a lot of people said that was the most impactful scene in the film for them. For me, it’s a nice place to revisit because you see what’s at stake. Anyway, you’ve worked on Sanders’ staff, I assume that’s how you got to know, not only him but some of the other “talking heads” like Cenk Uguyr, Van Jones, people you bring in over the course of the film. Were these people that you already had in your existing political network? For some of them, but a lot of them we didn’t know and I didn’t know them before. A lot of what we spent time doing, especially in the early part of the project… was: who do we know that knows somebody that knows somebody that we want to interview. That was just a lot of the normal networking stuff, but a lot of those people are pretty high profile. It helped that I had been working for Bernie, it shows that there’s some credibility there. But a lot of it was just that shoeleather networking stuff until we were able to find the right person who could connect us to someone we wanted to interview. So you mentioned before that when you decided to make this documentary, you thought there was a certain spark of something larger starting to manifest. I think that really comes across in the documentary, where you see different groups like Black Lives Matter, the LGBT movement and the Workers Rights’ movement. These groups they start to coalesce in moments like Occupy Wall Street and also in the Bernie Sanders’ campaign. What my question is, right now, what made you realize that this is going to be a moment? There were a bunch of things that were all happening, they were interesting individually. But since they were all happening at the same time it just felt like “wow, something big is happening or might be happening.” One of the big triggers for me was when Senator Sanders was thinking about running, he was doing these town hall trips, often in very deep red states. He was getting a very enthusiastic reaction even then before he really had a national profile. That’s kind of interesting, he was travelling where people who call themselves Socialists or Democratic Socialists shouldn’t be able to go… he was drawing people who were engaged and his message was really resonating. We were also seeing people on the far left win elections like the Seattle City Council has a self identified socialist now. So, some of it was that; people holding those far left views were winning races. In Richmond, California, Chevron had, for a long time, basically bought city council. But the grassroots were able to wrest control away from Chevron. Thomas Piketty’s Capital in the 21st Century was like, this 300-400 page leftist tome that was on the best sellers list for like 26 weeks. People were not just frustrated but they were worked up. Can you tell me a bit more about Piketty’s book? Why do you list that as one of those interesting moments? It’s a serious, pretty academic economics book. It just encapsulated kind of a deep sense that there was this inequity and the difference in the ability amongst normal folks to access the levers of power — people were feeling this much more sharply than we’d been accustomed to. In some cases, it materialized in a more right wing, populist form. But some of that was coming from the same place — people feeling very anxious and uncertain financially. Angst and fear drove, propelled both Bernie and on the right, unfortunately, Donald Trump into the positions of prominence that they both ended up with. What surprised me about your documentary, the film is not so much about what it’s like to participate in a political campaign from a logistical perspective. It’s more about the people who made up the movement. People who were interested in Bernie, people who continue to do good work now that the campaign is long over. Was that a conscious choice to construct the film that way? Because of the populist angle of Bernie’s campaign, did you want to see what different groups were interested in? As opposed as deifying Bernie, necessarily. The answer is…definitely! 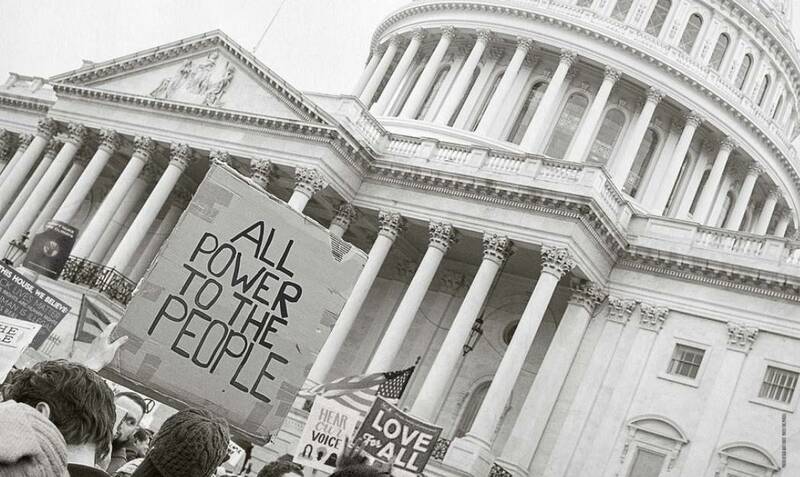 Part of what was so striking to us and was a core motivation for us making the film was the sense that there really was this effort to re-energize the progressive movement or the political left in the US. Part of the challenge that the left has always struggled with –at least as long as I’ve been doing this– is the endless argument of what the foundational challenges are. “Which challenges are the challenges that we have to tackle first before we tackle anything else?” You see that across a lot of movements, the campaign finance reform movement, the traditional left (what Van calls shorthand “The white left” in the film) looks narrowly through the lens of economic inequity. That’s been this long time struggle, all these different parts of the progressive movement arguing about how “everyone needs to drop their thing and come to my table.” It felt pretty early — there’s a suggestion that there’s an awareness of those barriers and willingness to work around them. I think that’s fueled by a number of the young activists who were part of the Bernie Campaign, supporters of Elizabeth Warren. We see pretty clearly that for younger activists, intersectionality is really central. It’s not even something necessarily that they have to talk about. For a lot of older activists, that just hasn’t been the case. We wanted to show how people across movements have been trying to bridges. I’m glad that came through, that was very much the hope. Um, you’ve all these different groups and in a lot of cases, political conditions have gotten so dire that it’s an issue of day-to-day survival. Let’s take Black Lives Matter, people in that movement often they have very immanent physical threats, represented by institutionalized Racism and police violence. Let’s also take someone who lives in Appalachia, often times they too face very real threats to their life in the form of this, you know, basically imposed poverty. For either group to be okay with setting aside their essential goal to live up to a leftist unity… it’s not going to happen. One good example, we filmed for about three and a half years. During that time we met many campaign finance reform activists who argued “we can’t solve anything until we fix how campaigns are financed.” In those three years, not once did we meet or have a conversation with a racial justice activist who put campaign finance reform on the list or believed it was top priority. Now, I’m sure there are people of color and racial justice activists that care about campaign finance reform but that was not the broad sense that we heard in those conversations. African Americans who live in California are much MUCH more concerned if they’re going to get pulled over, are their kids going to get beat up by a cop, is a cop going to arrest their kid or their spouse, is their daughter going to end up ostensibly committing suicide under very suspicious circumstances when in custody of the LA County Sheriff’s Department? One of our challenges as a movement is to be willing to step back from we’re so convinced is true and convinced the priority has to be and instead of demanding everyone come to our table, let’s figure out how we can listen better. There’s a bunch of analyses, lens and perspectives that people bring to bear — let’s just figure out how we can be mutually supportive instead of demanding unity around a single priority because I don’t think there is one that we can build unity around. I don’t think, even if there was a way to do it, it’s not reflective of the daily lives/lived experience of so many people across the left and across the country. You start to get into broad interpretive stances here, right? I think the totalizing narratives that we used to see in modernist old-left movements were, in a lot of ways, very exclusionary. In the documentary, especially towards the end, there’s this sense that the only way to have genuine politics is if we have a political system that sits everyone down at the table and is sensitive towards differences in lived experience. There’s one young woman in the film who says “the new direction for American politics is centered around the discussion of how class, race, and gender shape economics.” Can you talk a little bit more about what that might look like? I don’t have all the answers for what this revitalized movement needs to look like in its final form. What I can say is there are a lot of examples of people building these cross movement coalitions. Those are the models that we should look at. We tried to show that a little bit toward the end of the film at that meeting in DC with millennial activists that come from a whole bunch of different movements. You see them, in real time, essentially, trying to figure out: how are we going to build something that’s respectful across all of these movements? Jan’s work in LA is a great example too, she’s very explicitly bridging labor and racial justice. She’s a 20 year transit union member and she’s also a racial justice activist. As you probably know, labor (the police unions) is one of the biggest barriers to the reforms that the racial justice activists are pushing for. Someone like Jan who’s explicitly building these bridges is just incredibly powerful. Democracy Spring, when they first started, were very focused on campaign finance reform but they start to talk more and more about coupling that with ballot access [an issue that often concerns racial justice activists]. Getting back to the logistics of shooting a documentary; when you’re there on the ground, what’s that like? I’m sure it’s a very busy situation. There’s people running around, making phone calls, going door to door. How do you A) keep track of everything? B) Did you feel like you had to stay out of the way? It varied, with people like Jan [a racial justice advocate featured prominently in the film] and Sabrina [a grassroots candidate running in West Virginia] that we spent a lot of time with in a personal way, intimate way; that required them to be comfortable with us having a small crew with a camera and sound person and sometimes a producer. That certainly required their willingness to allow us to intrude in that way in their lives. On the campaign side, we had to get their okay to shoot and it was pretty chaotic sometimes. There it was kind of a mix, some of it people were friendly and let you in and other times you had to aggressively figure out how to get the camera where you want it to be and go in and talk to the people you want to talk to. I think this kind of observational film making is a mix of individual relationships. Where our field producers, etc had to build a rapport, trust and respect so we’d be allowed to film. Other times we might be filming moments that aren’t really tied to a single person, the producer and cinematographer have to figure out “how do I get the shots I need?” sometimes you can ask but you still have to be respectful because those relationships are really important and they’re trusting us to treat them fairly but yeah, when you’re at the convention or the New Hampshire primary trying to figure out how to get certain kinds of shots, the crew’s job on the ground is to figure out how to do that. Any documentary film team making a film like this – it’s going to be true for them. When Sanders’ lost, how did you deal with that? Did you have a contingency plan? Did you ride it out with the intention of turning it into a retrospective? One of the most interesting things to us, when that happened was realizing that the story of the film wasn’t going to end up being that different. The first hour and 10 minutes or so of the film — we’re telling the story of this movement building work. It’s framed by Bernie’s campaign but it’s not narrowly about Bernie and his campaign. We’re trying to tell a movement story, when Bernie lost the nomination, clearly the movement stuff is still happening and now has to pivot to the general election. How do we prevent Trump from winning? How do we make sure the Progressive movement is building out of this moment? On election day itself, when Trump won, we had the same realization. You know what, our story is about the movement building, it’s not about the outcome of any individual election. We didn’t have to revisit the structure of the story, the end of the film was different than we imagined it *laughs*. You saw those conversations; they were definitely reflective and depressed. So many people, right away, turned to- how do we build from here? We tried to capture that a little bit. Like Ai-jen [Executive Director of the National Domestic Workers Alliance] talks about the… she said the very next day they had a conference call set up trying to figure out how they organize from here. Those Millennial activists, I think they said that night they set up a listserv and the next day they had 200 people on it. People did not crawl into their holes. In our movement, people are always turning to, where do we go from here? We’re further back than we thought we would be but I definitely think it’s the same story. It runs parallel to what we were talking about how the documentary seems to focus on the coalescence of groups that were already doing work and continuing to be active today. Do you think that this type of documentary –where it might associated with a candidacy– do you think the documentary style that you chose is influenced by what might be called “Bernie Style” politics? You do have talking heads, but a lot of the people you pull on are average, everyday people. We didn’t think of it explicitly the way you described, but I can see why it might feel that way. We knew the story we wanted to tell and how we wanted to tell it. We made a film using the approach that we thought was the right or at least a right approach to tell the story we thought we were after. We didn’t think of it — you’re bringing an extra layer of sophistication to the relationship between the film and the movement itself but maybe it was there maybe a little more implicitly but the approach was very intentional. We felt we needed some talking heads because there’s a conceptual layer that requires some well recognized, incredibly eloquent and power speakers articulate some of that context — we felt that was going to be helpful but the film wasn’t going to be about that. We had some really cool interviews, an interview with Danny Glover and Zephyr Teachout and just a bunch of really cool people and we couldn’t leave them in because it’d be too much of a talking head film. In the long term, what is the objective of this film? What do you hope that it does? I don’t know how to answer that — I don’t know. I don’t think we made a perfect film. I’m not sure there are really big scale things we would do different. There are things like “oh I wish I had some footage of that” or “I wish we’d asked that question.” On the bigger picture, I think all three of us feel good about the decisions being made. If we’d go back and do it again maybe make a different film. We don’t view this as the definitive film on the 2016 presidential race. There are lots of people who have really important stories to tell. The very best case for us is that our film is one of multiple having a conversation about the power building and where we go from here. Filmmaking, politics, it’s all messy stuff. Did anything happen that was unexpected? Anything happen that made you take an angle you didn’t foresee? At the very beginning, we thought the story was going to be about Bernie’s effort to bridge populist sentiment in the left and right. He was clearly framing a lot of the issues he cared about in that way. He was thinking about people who shared economic angst. While we were starting to make that film, we saw how BLM activists start charging the stage. Racial justice advocates began demanding that these traditional, economically oriented left wing activists think about race, just as it forced those candidates to think and talk differently about race — it forced us to think about it, too. This whole, cross-party thing might not be the most important part of the story, this tension between what Van Jones called the “black left” and “white left” was a much more important part of what was going on. It’s something we had to figure out how to grapple with it — both politically and in the film. What is next for you? Are you going to keep making films? Are you going to go past to activism? Both? My guess: someday the three of us are going to make a film together again. I’m definitely going to keep making films, I’ve got two more I’m working on. I’m definitely still an activist. So my answer is, yes — it’s going to be a mix of both! If you’d like to get in touch about screening Waking the Sleeping Giant, visit here. Alex Palma is a devoted member of the Philadelphia historical community. In his own time, he's an avid gamer and rabble rouser. Above all; an enthusiast of archives, tech culture, and continental philosophy.